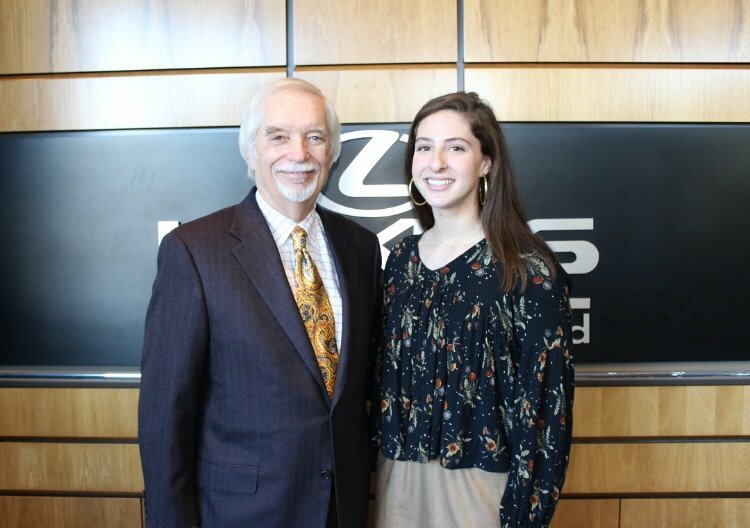 Lexus of Richmond’s week 17 nominee for the Leadership Award Scholarship is Emme Levenson of Douglas Freeman High School. She is enrolled in her school’s Center for Leadership, government, and Global Economics. With a 4.2476 GPA Emme is ranked within the top 14% of her graduating class. She is a member of the National Honor Society and the National French Honor Society. Emme is an AP Scholar and a member of the National Beta Club. Along with her team, she is the 2018 We The People Regional Champion. Emme has been recognized as an All-Academic athlete for both her conference and region for Douglas Freeman. Outside the classroom, Emme is involved in several organizations and activities. As a four year member of the Circle of Friends Club Emme has spent over 100 hours with the integrative services (exceptional education) class. She helps the students in the adaptive physical education class where they play sports and learn exercises. As a senior she is an Action Leaning Aide where she mentors and promotes inclusion for all students. Emme is a four year member of both the French Club and the Rebelettes Club. In 2017 she became a Sports Editor for the school newspaper, The Commentator. Emme will write articles and design the page layout for the sports section. Throughout her time at Freeman, Emme has competed on the Varsity Tennis team and is the captain for her senior season. Every season she has been the #1 seed in singles and doubles for Freeman. She is the 2018 Singles State Champion as well as the Regional Champion. For her junior season Emme was named the All Metro Girls Tennis Player of the Year and the Regional Player of the Year. As a junior she had a 20-0 singles record, and she was selected for the doubles All-Region team. Emme was named to the 2017 All Metro 1st Team. As a sophomore she finished her season as the Conference Runner-Up, the 5A South Runer-Up, and a State Semifinalist. As a freshman Emme was selected for the All-Metro 2nd Team. She is currently ranked #225 in the Nation, #14 in the Mid-Atlantic, and #8 in Virginia. Emme will continue her tennis career playing for Colgate University next school year. Over the summer of 2018 Emme spent significant time with Celebrate! RVA, a non-profit which celebrates birthdays of underprivileged children in the Richmond area. She has participated in multiple Special Olympics events such as: yearly meets for the Big and Little Feet Meet where she assists with children with disabilities. Through her participation with he Frankie Woolwine Story, Emme helped organize and designate first fundraising wristband project to help educate teens on the dangers of drunk driving. Emme has won a dinner for two and is now in the running for the $10,000 scholarship. Watch the Fox Richmond – WRLH interview and the Lexus of Richmond Leadership Award interview to learn more about Emme! Remember to check Facebook for more information about each weekly nominee throughout the school year!